Exceptional color rendering index (CRI) ratings are required in some commercial and industrial facilities, such as paint spray booths and art galleries. But what about homes? Can residential spaces benefit from LED lights with high CRI ratings? The short answer is yes. Find out more below. By definition, CRI is a metric used to gauge the visual output of a light. It is used by individuals to better understand the way colors are depicted when the light source is used to illuminate the room or objects inside the space. A scale ranging from 0 to 100 is applied to indicate the CRI value of a lamp, with 100 being superior and 0 being very inaccurate. As a general rule, a CRI rating above 90 is considered exceptional. CRI values below 80 are acceptable (mid-range) in commercial sites and general areas of an industrial building. For homes, LEDs with mid-range CRI ratings are suitable for most sections of the space. Sections of the home that frequently facilitate detailed tasks can benefit from high-CRI LED lights. For instance, stove tops and prep counters in kitchens may utilize such LEDs, as quality of produce and doneness of meat and vegetables rely on accurate color depiction. 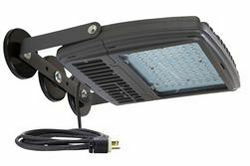 Work tables inside garages and bathrooms are other areas that can benefit directly from high-CRI LED fixtures. Such lighting options are recommended for supporting hobbies that deal with colors, such as painting, carpentry, upholstery and more. While it might be tempting to install high-CRI LED units around the entire house, there are some parts of the home that does not really need this type of light. Outdoor patios and entry ways are fine without extremely accurate lighting systems. Moreover, bedrooms, hallways and sections of the home with low activities most likely will not need this type of LED lamp.